The Docks of Kirigakure used to be a village unto themselves. Now they stand mute, deserted in the wake of the freeze. The piers have snapped under the cold, houses lay crumbled and caved in. Here is usually the first place the anomalies begin, as one begins to see figures in their peripheral vision or hear words carried on the constant winds. And sitting at one of the docks lies a large ship of wood. Around this ship is liquid water, somehow resisting the freezing ice, and it bobs as if on the high seas still. An ever present theme of age and chaos lay over the land of water, with its history forever cased in ice, and the roaming occupants virulent and vicious. However the land did possess a level of tranquility to it. The rolling waves of a tropical ocean, encased in time and preserved through nature seemed to strike a chord with Akagi. Like the waves frozen in the midst of crashing, he felt held back and limited, and he could only see one solution, he needed to break the ice. Ice diligently gilding the wind gives it a reflective property, making it somewhat visible like a wisp or spirit. 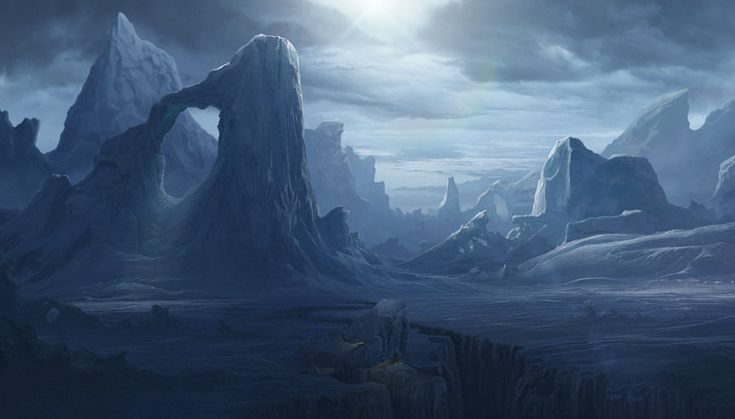 These wisps dash across the landscape, carving into the land reaching the vast caverns of ice beneath the frozen tundra above. The heavy fog was decadently intricate, lining over top an unnamed port city which had been frozen ages ago. The atmosphere from all these details brewed deep feelings of acrimony and rancor. This concoction of resentfulness was the setting for the beginning of a mission, however, not one of love or redemption. This mission was to uphold a single conviction. Two figures battling a headwind side by side, marched toward the abandoned port city under the cover of the late night and dense fog. Their steps masked by the chilled winds echoing wisp, their bodies hidden by fog, they seemed to barely exist. While they themselves were hidden their destination, was far from it. The path the two took now seemed to lead straight to a deserted port city, stilled in ice, more specifically its dock where it once saw ships day in and day out. A single feature however tiny stood out among all others. A single light lie still like a lantern, posted up like a new lighthouse just on the edge of the dock, its flame barely flickering. As the two approached the edge of the dock as ice cracked under foot, the details of the two became much more visible. One dressed in a long brown cloak that hung down to its knees, a double edged short sword lie on its back with its face hidden underneath the hood of the cloak. Next to it was a younger boy, wearing a white jacket and white pants which seemed to match his similarly white hair. The mood surrounding the two was serious and one of violent disposition, each step weighted with a motivated malice. The dock stood around five feet off the frozen sea level, and the lantern at the end stood another seven feet off the dock. The hanging gas mantle produced a small tender flame which drew many questions at first but was soon answered quite efficiently and simply. As the two perused toward the end of the dock, now within at least twenty meters, a similarly cloaked figure, appearing dimly beneath the lantern. The initial reaction from the two was a halt, the cloaked one holding his hand out to the younger boy with an open palm, signaling him to stay. Would take another step toward the cloaked figure, before balling his hands into fists. This was a new feeling, a feeling of relief. The cloaked one continued making its steps in solitude toward the figure standing tall at the end of the dock. Initiative was building inside the atmosphere and the center of the pressure was the cloaked one. His hand fell into enough light for one to see that there were tight wraps lining up the figure's forearm, and a distorting aura emitting from the hand. Never flinching the man underneath the lantern stood confidently in waiting and as if orchestrated by nature a large gust began to kick up. The gust roared toward the cloaked figure as it picked up snow and ice off the ground, its hand now being enveloped by a blueish purple shapeless aura. Finally moving, the figure on the dock slowly took its hood off, revealing a bald headed man, with a unremarkable face grimacing. Without hesitation he leaped down to the ice below the dock, and began sprinting toward the cloaked one. Coincidentally the earlier gust of wind in these moments reached the cloaked one, the wind blew past unfurling his hood as his hand began to erupt with light. The man's grimace turned into a smirk as he recognized the features on the figure's face before an extremely bright blue light would engulf the cloaked boy, followed by a loud boom of sound. The hand from which all this power was stemming from, seemed to have a strange light glowing from three tally marks on the palm itself, a stand out purple among all the blue. After his eyes adjusted the bald man realized he had halted after the blast and was standing before an amassing surge of energy. However it was too late, reaching his hands up to form seals, he was quickly interrupted as the boy and the energy all disappeared for a brief moment before the same blindingly bright light appeared directly in front of him and without a chance to even react, from the mass of energy came rocketing the same fist from earlier slamming into the bald man's nose, in this moment the boy was lashing out and exposing his hatred as the punch seemed to last as the boy pounded his heart into the man's face, before finally pushing through with the punch as all the building energy was stored in his arm now released into the man, his cloak began to tear underneath the pressure of the boy's fist as his eyes finally made out the menacing face of his attacker before finally being propelled backwards into the supports of the dock, smashing through a few, not compromising the integrity of the rest of the dock. After smashing inoto the supports the man finally slammed into the ice causing it to crack underneath him as he slid to a halt. The energy had dispersed from the cloaked boy, who now stood up straight panting with his fist clinched still emanating a purple light from his hand. "I thought I would break the ice." Standing over the man, the boys back stiff, fist still clenched but now ceased to vent energy. "Where is Miu." the voice ringed deep from the cloaked figure, the tone was becoming deeper as he matured but this tone was of stress and pressure. To save someone who needed it was his mindset from the get go of the academy, and now to question his ability to follow those ideals visibly frustrated the boy. Akagi's eyes shining down from above pierce into the man prodding him with the question. The man's face after the blow was distorted, a clear massive abrasion across his right cheek showed the clear difference in power between the two, yet despite the blow's power the man was still conscious. Grumbling out of his swollen face the man spoke, :"If it's the girl your looking for... good luck finding her, and since I am sure I am finished, I dont mind telling." Holding back to let the man speak Akagi's grimace and stomach turn with every word, "She isn't ready to be the vessel." pausing for a brief moment "Her time will come again soon." his face contorting only partially from its swelling into a sly grin. "What do you mean vessel?!" Demanding more answers, Akagi's brain is running wild with possibilities, but nothing matches what the man was saying. From his question the man places his left hand down onto the ground picking himself up to his knee's. Akagi raising his hand to the man's neck with a finely sharpened chakra stream grazing the man's neck. Forced to stop moving the man raises his hands to the air gesturing to deescalate, "No one has to get hurt I just needed to deliver this message to you when you arrived." The news shocking him down his spine Akagi's knees nearly buckled as he heard the words, realizing he had been too loud in his search and had the procedure succeeded would have failed to save Miu. Falling to one knee Akagi's eyes began to shake along with his whole body shivering till buckling over to the ground. The man slowly standing to his feet stumbles backwards before catching himself and walking limp into the dark icy distance. Frozen to the ground Akagi's heart had sunk to its deepest point, his lack of discipline caused him to not make haste. Lying motionless on the ice, his nose turning red Akagi wonders where Kanmuri must have gone, but has since lost interest as he only wish to lie there and die. An eternity of time passes in what in reality is only a few seconds as Akagi's body begins to feel the affects of the cold weather, his heart feeling like it weighed thousands of pounds was hard for Akagi to bring himself to his knees, stumbling beyond the dock up the bank into the small dock town. His will to live to see at least some of his ideals fufilled drived him somehwat still even beyond the weight of his newfound emotions. His vision blurry as he became more and more disoriented, Akagi moved from building to building before stumbling upon an old carriage. Quickly leaping in up and under the canopy of wool that housed the caravan Akagi wrapped up in his cloak seeked answers he knew he could only find in his head. Closing his eyes he felt his body go numb as his mind washed over into sleep, the wool from the caravan protecting him from the cold and insulating what heat he was giving off made the environment somewhat usable. His mind felt oppressed, nearly controlled. Strange he felt.